Forages are plants or parts of plants eaten by livestock (cows, horses, sheep, goats, llamas), and wildlife (deer, elk, moose, rabbits). There are many different types of forages. Some of the most important are listed in the table below. Table 1. Forage types and definitions. Forage Edible parts of plants, other than separated grain, that can provide feed for grazing animals, or that can be harvested for feeding. Includes browse, herbage, and mast. Browse Leaf and twig growth of shrubs, woody vines, trees, cacti, and other non-herbaceous vegetation available for animal consumption. Herbage The biomass of herbaceous plants, other than separated grain, generally above ground but including edible roots and tubers. Forb Any herbaceous broadleaf plant that is not a grass and is not grass-like. Legume Members of the plant family Fabaceae. Grass Members of the plant family Poaceae. Grass-like Vegetation that is similar to grass in appearance and is usually a member of the plant family Cyperaceae (sedges) or Juncaceae (rushes). 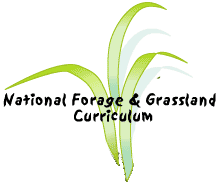 Pasturage Not a recommended term.The recommended definition of pasture refers to a specific kind of grazing management unit, not that which is consumed, which is forage. Thus, pasturage is not a useful term. Mast Fruits and seeds of shrubs, woody vines, trees, cacti, and other non-herbaceous vegetation available for animal consumption. Forage crop A crop of cultivated plants or plant parts, other than separated grain, produced to be grazed or harvested for use as feed for animals. Aftermath Forage grown following a harvest. Residue Forage remaining on the land as a consequence of harvest. Silage Forage preserved in a succulent condition by partial anaerobic, acid fermentation. Hay Grass or other plants, such as clover or alfalfa, cut and dried for fodder. Haylage Product resulting from ensiling forage with around 45% moisture, in the absence of oxygen. Fodder Coarse grasses such as corn and sorghum harvested with the seed and leaves green or alive, then cured and fed in their entirety as forage. Green chop Fresh cut forages.